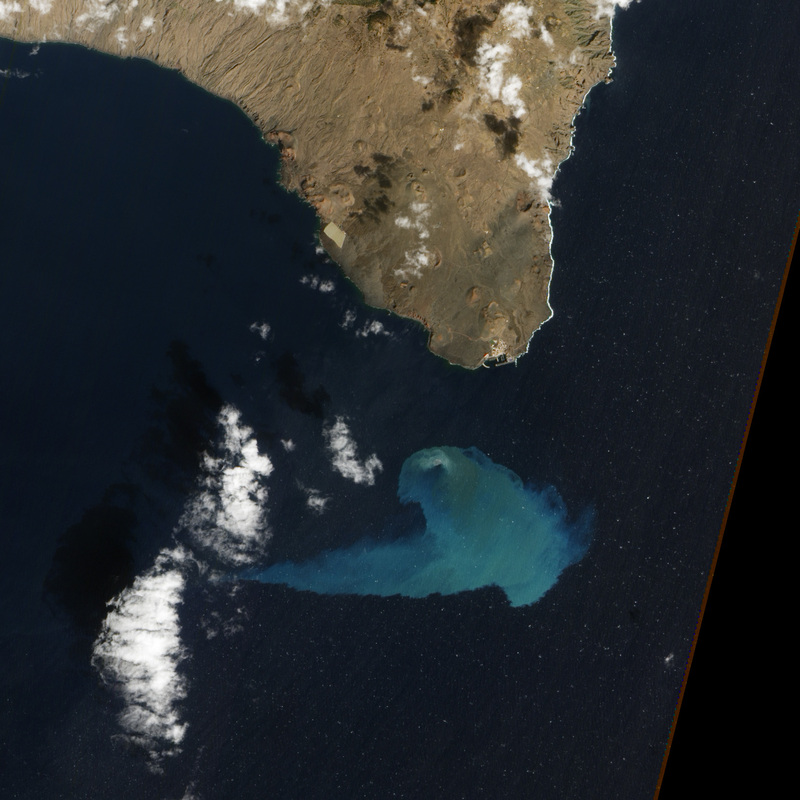 Four months after it began, the underwater volcanic eruption off El Hierro Island persists. 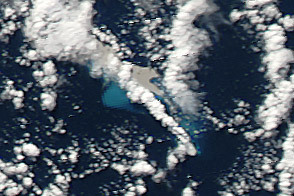 This natural-color satellite image, collected on February 10, 2012, shows the site of the eruption, near the fishing village of La Restinga. Bright aquamarine water indicates high concentrations of volcanic material. Immediately above the vent, a patch of brown water resembles a turbulent hot tub and indicates when and where the eruption is strongest. 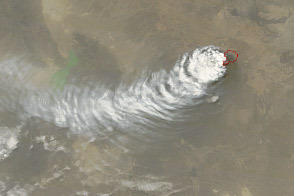 Video of the eruption shows the activity in more detail. 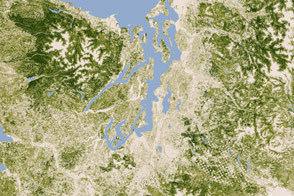 This image was acquired by the Advanced Land Imager (ALI) aboard the Earth Observing-1 (EO-1) satellite. 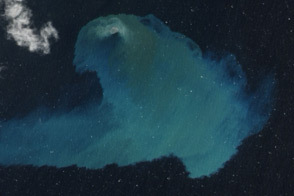 The eruption is just off the southern coast of El Hierro, the youngest of the Canary Islands. 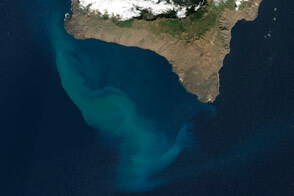 El Hierro is about 460 kilometers (290 miles) west of Morocco and Western Sahara. According to El Hierro Digital, measurements of the sea floor by the Instituto Oceanográfico Español found that the volcano’s summit is now only 120 meters (390 feet) beneath the ocean surface—10 meters (30 feet) higher than it was in mid-January. The height of the erupting cone is about 210 meters (690 feet) above the former ocean bottom, with a total volume over 145 million cubic meters (5.12 billion cubic feet) of new material. 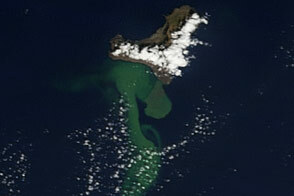 Four months after the eruption began, the submarine volcano is growing ever closer to the water surface. 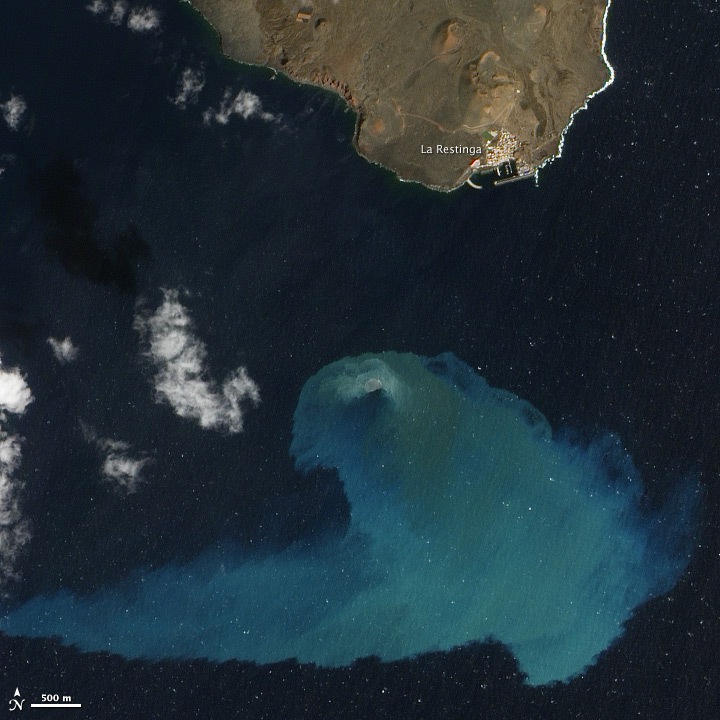 A submarine volcano off of El Hierro in the Canary Islands began erupting gas and tephra into the sea in mid-October 2011. El Hierro Digital. 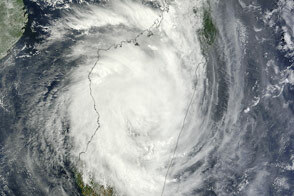 (2012, February 14). 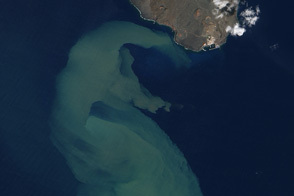 El IEO ha establecido la profundidad de la cima del cono principal de la erupciÃÂ³n submarina en 120 metros Accessed February 14, 2012. Instituto Oceanográfico Español. (2012, January 20). El cono volcánico de El Hierro se encuentra a unos 130 metros de profundidad. Accessed February 14, 2012.